Spectacular Lake Front Combie House - Great for Family Fun! This Beautiful, comfortable, cozy two-story family home has five bedrooms and 3.5 baths, a beautiful large updated kitchen with a double oven, two sinks, and oversized refrigerator. A spacious living and dining room, and a large comfortable family room. This is a perfect vacation home. In the summer you have access to a private lake for water skiing, wake boarding, fishing, kayaking, canoeing, and swimming. The house is located at the foothills of the Sierra Nevada mountain range and is surrounded by beautiful pine and oak trees. 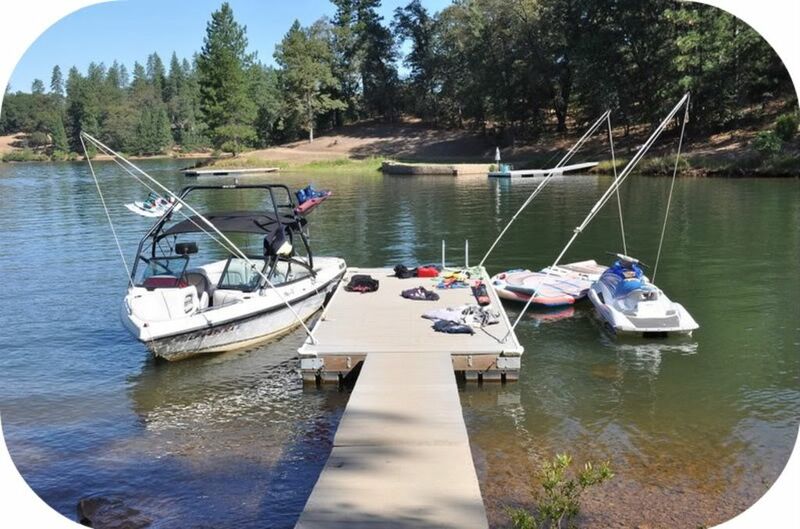 It is located about an hour from Sacramento, an hour from Lake Tahoe, and ten minutes from the quaint town of Auburn, California with plenty of shopping available. The house has a private dock next to a sandy beach. It also has it's own private launching ramp so with the owner's permission you can launch a boat or wave runner. PRICE QUOTED IS FOR ONE BOAT OR ONE WATER CRAFT. Additional fees will apply for more than one boat or watercraft and you must receive permission from the owner to launch an additional number boat or watercraft. There are two large decks. One is off the kitchen and has a gas BBQ and a 12 person patio table that overlooks the lake. You can enjoy your meals while admiring the beauty of Lake Combie. The second deck is off the downstairs family room. It is perfect for quiet reading and relaxing. During the winter, this is an ideal place for a quiet getaway or a fun-filled skiing vacation with the family. It is 45 minutes to the nearest ski resort. There is a television but it is not hooked up to satellite or cable. You can only play DVD's on it. Perfect for families who like water sports and who have kids. The property works well for a family - having 5 bedrooms and 3-1/2 baths. It is about 75 yards, downhill from the lake, so you don't have to worry quite so much about little ones getting down to the water without being noticed. Very little boat traffic on the lake, so the water is nice most of the day. Family size kitchen and dining area, along with the table on the deck, make it easy to get people fed and is great for socializing. Can be tricky to launch/retrieve watercraft because there is not community launch ramp. There is a launch, though - just tricky. Close enough to stores, gas, etc., to make it easy and lots of restaurants within easy drive. House and property are perfect for a large family vacation. We had 12 and others joined us for several meals. Lake and sand bar were a huge hit with 7 children under 10. Loved it!! Perfect home for our family gathering! We really enjoyed staying at this Lake Front house! I wish I could have taken the kitchen home with me....it was a great size for having lots of people in preparing food. There is lots of room for everyone to spread out, upstairs and down. The weather was nice and was it was great to walk down to the lake and relax on the dock. We had a fun time connecting with family, playing games, eating food, and relaxing in the great environment! This was a perfect place to vacation and connect. Our family had the best family vacation here! My 6yo son caught his first fish, and has been talking about it all summer long. The big sand beach was perfect for our daughter to play in all day, and there were barely any boats on the water. It is absolutely beautiful, and a great way to spend quality family time. There was plenty of room in the house and the kitchen was huge and amazing. Loved cooking in there every night and eating on the deck. Can't wait to return to this amazing place! We traveled to the area for my son's wedding from Minnesota and this home was perfect for our large group. The kitchen, dining room, living room and deck are perfect for entertaining, the kitchen has everything you might need and more! Unfortunately due to the drought we were unable to enjoy the lake because the water was so low, this was not a priority for us, but may be for other renters. The owner is very responsive and available for questions. The only negative comment I would make is that the home was not as clean as I would have hoped. It looked clean on the surface but it was in need of a deep cleaning and the yard needed attention. Overall we had a great visit and I would not hesitate to rent the home again. I am glad you enjoyed the house. I agree that it was time for a deep cleaning. I had the house deep-cleaned and the carpets cleaned. Concerning the yard, unfortunately, due to the drought and water restrictions, much of the landscaping has turned brown. This happened last October but with the winter rains, by spring, everything was green again, beautiful, and in full bloom. As for the lake, the water level has dropped in the fall/winter for the last few years but thankfully, every spring, the lake fills up again and we have not yet missed a summer of boating. YET! Large spaces, exceptionally maintained, fully stocked, everything works! Plus, beautiful and surrounded by trees. Lake wonderful. Piano, bring sheet music. Books everywhere, Lucy has MORE towels and blankets than YOU have. LOVED IT. Just don't rent it when I want it again.....or ELSE! LOL Also, at least six golf courses within 30 min drive. Renter's may launch no more than one boat. Launching requires a 4-wheel drive vehicle. (Boat is not provided) Security deposit is refundable if there is no damage to the house or property. Security deposit is due upon booking the property. Rental fee is due 30 days prior to occupancy.